Comtrol and a few other companies have collaborated to create a solar-powered security system to monitor critical infrastructure around the world. The system is responsible for monitoring the power grid and establishing surveillance to prevent material theft and protect critical operations. As seen in the diagram, security cameras in each location record live feed from the grounds to send via Ethernet to Comtrol’s RocketLinx ES8105 industrial Ethernet switch. The data travels via Ethernet to a wireless bridge, which communicates the data to a remote control center network. In order for this system to operate efficiently, more equipment is needed. Also connected to the ES8105 Ethernet switch is a network console device. This device is responsible for auto-rebooting the other devices and monitoring temperature and current draw. A UPS (universal power supply) card plays an integral role in the system, as it is connected to the power grid and providing different voltages of power to all of the devices inside of the cabinet. A solar panel installed close to the system equipment box supplies power to the system, though the main power source comes from the power grid. If there are any unexpected power surges or outages, the UPS card regulates the power to protect the equipment and prevent the surveillance system from failing. Batteries in the system box are charged via the UPS card as backup power supply if the power grid goes down. The UPS card also records power monitoring data which is sent via Modbus RTU to Comtrol’s DeviceMaster UP and eventually to the control center network. With rugged housings that operate in temperatures from -20° to 70°C, the RocketLinx ES8105 and DeviceMaster UP are used in this sytem to handle harsh weather conditions and withstand power surges. 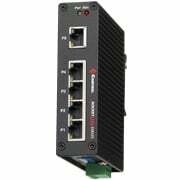 With both managed and unmanaged models available, the RocketLinx ES series of switches provide cost-effective networking solutions delivering the industry’s best rugged Ethernet switch technologies. The DeviceMaster UP provides EtherNet/IP™, Modbus/TCP, Modbus RTU/ASCII, and PROFINET connectivity to a wide variety of devices, and its many unique features offer connectivity options and flexibility not provided by other gateway products.